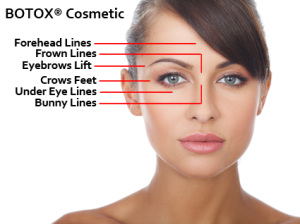 BOTOX cosmetic is commonly used to reduce or eliminate the appearance of facial wrinkles. 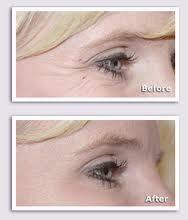 Botox Cosmetic treatment is quick and minimally invasive. You can expect to see results within a few days after your treatment; however, the appearance of the areas injected may continue to improve for up to a week. Results generally last between three to four months. Dynamic wrinkles are due to the action of facial muscles, such as, prominent forehead creases, brow furrows or eye lines (crow’s feet). Smooth away frown lines, forehead furrows, crow’s feet, neck, or just about any wrinkle on the face without surgery. Just a few small injections and you could look 10 years younger. A natural purified protein that binds with receptor sites to weaken muscle contraction thereby causing a reduction in wrinkles, fine lines and facial creases. Clinical trials began in the 1960’s with effective medical treatments beginning as early as 1976. The effects typically last 3-4 months with no down time! Areas which are treated may include: lip lines, dimpled chin, mouth frown, gumm smile, neck bands, open eyes, bunny lines, v-neck lines, frown lines, forehead lines, crow’s feet, brow lift and necklace lines. What keeps us looking youthful? Collagen is what gives volume, flexibility and strength to healthy, young skin. As a part of the aging process, your own natural collagen breaks down, diminishing facial volume and elasticity. This loss of elasticity and volume results in wrinkles, facial lines and skin laxity – all of which rob your skin of its youthful, fresh appearance.Fillers are the answer to rejuvenate! Voluma – Juvederm Voluma XC injectable gel is the first and only filler FDA-approved to instantly add volume to the cheek area. It gives you a subtle lift, helping to restore contour and a more youthful profile for up to 2 years in patients over the age of 21. It’s different than Juvederm XC and works on a different area of the face. Voluma XC adds volume to the cheek area to give you a more youthful look. There are many new and exciting anti-aging treatment options available thanks to the many medical advancements. This fact makes it essential for patients who are looking for the top anti-aging treatments to further explore all of these options in order to make sure that they choose the treatment that will work best for them. Anti-aging facial injections are highly effective anti-aging treatment options that can treat early signs of aging as well as more advanced signs of aging. While anti-aging facial injections are also known as facial fillers or dermal fillers, not all anti-aging facial injection options are true facial or dermal fillers. Anti-aging facial injections begin to take effect after we inject soft tissue fillers and more into the deeper layers of the skin. These fillers will help to smooth out any facial wrinkles as well as plump up the area, giving the patient an overall smoother look. While anti-aging facial injections are able to work many wonders for reducing fine lines and wrinkles, every anti-aging injection option is temporary. The fillers are temporary since the body will absorb the contents of the fillers over time. Since every facial injection choice comes with its own list of ingredients, we can go over these ingredients with patients during a consultation. Commonly used absorbable anti-aging materials include collagen, lidocaine, hyaluronic acid, calcium hydroxylapatite and poly-L-lactic acid. Non-absorbable materials include polymethylmethacrylate beads. There are many benefits from choosing anti-aging facial injections. The collagen and elastin in our skin will begin to break down over time, eventually leading to noticeable fine facial lines and wrinkles. Other results from this break down can include dark circles under the eyes, hollow cheeks, fine lines around the mouth area and thinner lips. The following are some of the more popular anti-aging facial injections choices that can help patients look the way they want to look when fine lines and wrinkles begin to appear. Voluma is a fairly new dermal filler option that can be used to add more volume to facial areas that are sinking or are appearing more hollow with age. The main benefit of choosing Voluma is that it lasts up to two years, making it the longest lasting FDA-approved facial filler. Other anti-aging filler options tend to last an average of about six to nine months. A few reasons as to why patients may not be a good candidate for Voluma include severe allergies or a history of anaphylaxis. Botox is one of the more popular anti-aging choices patients are making these days. Botox works by weakening or paralyzing the facial muscles, essentially relaxing them so much that facial lines and wrinkles are extremely minimized. Patients who have skin disorders, deep scars or a history of a neuromuscular disease may not be candidates for Botox. Benefits of Botox treatment include the fact that Botox is a minimally invasive procedure and is clinically proven to provide patients with a more youthful appearance. Juvéderm is one of the newer anti-aging treatments available and is currently the only non-surgical dermal filler approved by the FDA. Juvéderm is able to provide patients with immediate results, which is why so many patients are looking into this modern anti-aging treatment option. Several benefits of Juvéderm include reducing the overall appearance of moderate to severe wrinkles, as well as helping smooth out the facial folds that start to become noticeable and even prominent with age. Patients who have severe scarring, have severe allergies, are pregnant or nursing, are taking certain medications, have a history of neurological diseases or have skin infections are not good candidates for this treatment. Face injections are a popular choice for patients who are looking to combat fine lines and wrinkles that come with age. While many face injections work best for patients who want to minimize fine lines and wrinkles, there are others that work better when it comes to lessoning deep facial creases and increasing overall facial volume. Lip injections are a popular choice for patients who want to reduce the look of the fine lines that start forming around the lip area at a certain age. Lip injections are also a common treatment when a patient’s lips are beginning to thin due to aging. 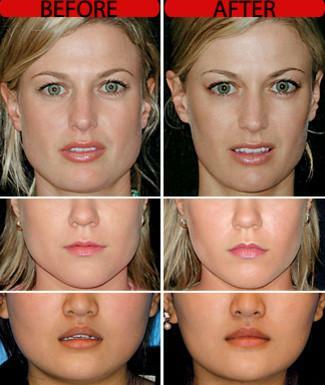 Lip injections allow for a fuller, plumper look that can give patients a younger appearance.